Fiery Roman Catholic preacher and Spiritual Director of Adoration Ministries Enugu (AMEN), Rev. Fr. Ejike Mbaka, has warned President Muhammadu Buhari to change, or else Nigerians will change him in 2019. Mbaka issued this warning to the President last night at the 2017 Crossover Night of his Ministry at its Adoration Ground Emene Enugu. At a similar forum in 2014, Fr. Mbaka prophesied the defeat of then incumbent President, Dr Goodluck Jonathan of Peoples Democratic Party (PDP) in the 2015 general elections and his replacement by General Muhammadu Buhari of All Progressives Congress (APC). That prophecy came to pass. But, speaking on Sunday night, Fr. 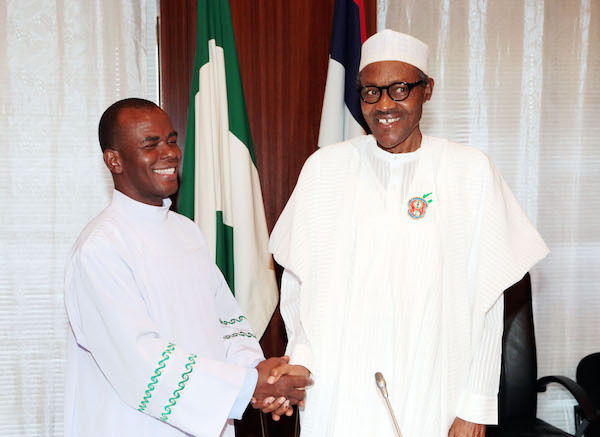 Mbaka expressed disapproval with the leadership of President Buhari, lamenting that Nigerians have suffered untold hardship. He said Buhari must change quickly or else Nigerians will vote him out of office in 2019. “He should change quickly or else Nigerians will change him in 2019” Mbaka said. The preacher said Buhari is a good man, but he has been hijacked by a cabal. Mbaka said Buhari should not go for a second term and advised the Northerners to look for another person in 2019. He suggested that somebody like Gombe State Governor, Ibrahim Dankwanbo, should be supported by the North for president in 2019. Mbaka said he does not know the party Dankwanbo belongs, but has gone to Gombe state and seen he is doing well.